With continuous changes and evolution taking place in the legal sector, and numerous challenges facing law firms who carry out their business in a “traditional” manner, Wilford Smith has chosen to position itself at the forefront of legal technology to provide a superior service to our clients. We have chosen to utilise modern internet strategies to make ourselves as visible as possible to potential clients, generating business and improving competitiveness by establishing a prominent identity online. Built and supported by online business generation specialists, our website – wilfordsmith.com – is robust in both the quantity and quality of its content, and we have sought to use modern internet based practices combined with a responsive online platform to allow clients to find out about what we do quickly and effectively. It’s not only about what happens with clients making their initial online enquiry with us – we have invested in developing an end-to-end solution so that enquiries from our website are instantly placed in our system so that we can follow up on all enquiries more effectively and deliver excellent legal services to our clients. With continued investment in our online strategy, with our new platform having launched only in the past couple of months, we expect our online presence later in 2018 to give us an enviable position in the market. This will enable us to attract new business, strengthen existing relationships with clients and demonstrate our expertise in specific practice areas. We hear stories of some law firms still running their business through emails and Word documents only, but without a professional case management system, the service delivered to the client would undoubtedly be weaker and less efficient. Wilford Smith provides clients with high quality legal advice across a wide range of areas, including serious crime, fraud, corporate crime, directors defence, commercial and residential conveyancing, motoring offences and estate planning. With teams based in Sheffield, Rotherham and London, we assist clients throughout England and Wales. We offer strategic legal thinking, presented in a manner that is clear and free of jargon, as part of our exceptionally personal service, and are able to call on the support of the highest quality barristers when necessary. At Wilford Smith, we embrace modern internet technologies to make ourselves the go-to firm for commercial and private clients. Get in touch today on 0808 278 2031 or contact us online. This entry was posted in Technology on 20 December 2017 by admin. The significant financial benefits of adopting cloud applications, software and infrastructure are encouraging more and more law firms to move to the cloud.Cloud computing is a non-traditional, cutting edge technology. At first glance, it’s not a perfect strategy for the legal industry. Law firms a reputation for being traditional and risk averse. But now many are embracing cloud computing. So, what is cloud computing? The definition is fairly changeable and hazy. Basically, it means storing your digital data on the internet, somewhere separate from your physical organisational headquarters. For example, a small law firm wants a customer management system (CMS). They can’t afford to have their own developed. No problem – they can hire access to an industry standard, first-class CMS through the cloud. They only have to pay for the small amount of customer data they store there, instead of a whole application. The firm’s customer data is stored securely and privately, somewhere on a server in California, and retrieved by the CMS when needed. Cloud computing has big benefits. It’s more flexible and scalable than more traditional data storage services. It’s cheaper as well. There are risks and unknowns to using any new technology, but the big up-sides of cloud computing are selling it to many legal professionals. With cloud applications, smaller firms don’t have to pay a large amount to develop on-site customised applications. Instead, they can pay to access a cloud application. This business model is known as ‘Software-As-A-Service’ or SAAS. Cloud software gives law firms a chance to compete against internet legal service providers that have recently entered the market, taking market share from current law firms. Law firms can keep their physical base, while taking advantage of internet-enabled services that improve productivity. Generation Y wants to access legal services over the internet. Providing for this demographic will allow law firms to keep their business. Cloud services have automatic backup facilities. Some experts consider web backups to be more reliable than traditional onsite backup. Internet data backup also manages risk of data loss if onsite backup is destroyed or lost. Cloud storage is environmentally friendly. A specialist cloud service provider can make use of economies of scale to get the most energy-efficient servers.For smaller organisations, a study showed there can be up to 90% reduction in energy use and emissions. A strategy that uses cloud computing can significantly lower overhead costs. This is particularly relevant for small law firms that don’t have enough business to fully utilise IT infrastructure. Cloud computing allows them to hire services only as and when they need them. It also reduces that need to hire staff to manage infrastructure. The UK medical specialist law firm Patient Claim Line is a good example of a firm that has embraced cloud computing. As with other legal specialists, information security and privacy was a key concern. The firm selected a private and secure hosted desktop environment. A cloud strategy has allowed them to implement more agile working practices, as well as enhancing the firm’s disaster recovery planning. Because cloud computing is a new strategy for most law firms, regulatory guidance has yet to catch up with current practice. 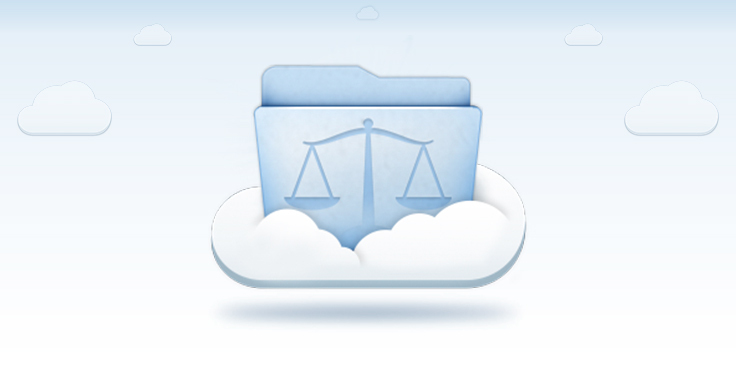 A recent whitepaper on challenges and benefits of cloud computing for law firms notes a “distinct absence of any conclusive guidance” from the UK Solicitors Regulatory Authority. Thankfully, the Law Society of Scotland has more practical guidance available. It’s important that clear guidance is out there. The benefits are so compelling that it’s inevitable that more law firms will move in this direction. Some of them are already seeing the upside, and many will follow as cloud computing enters the legal mainstream. This entry was posted in Technology on 22 February 2016 by admin.